UH Mānoa moved up two spots to number 157, the best ranking for UH’s flagship campus in five years, and just the latest recognition from a prestigious higher education ranking service. UH Mānoa is also eighth in the 2019 U.S. News and World Report ranking for Best Ethnic Diversity (National Universities) and 80th in the Top Public Schools category. UH West Oʻahu climbed two spots to number 5 in Top Public Colleges West. It also enjoyed a four-spot jump to 21st in Best Regional Colleges (West). “At UH West Oʻahu, our faculty and staff are committed to building dynamic, forward-thinking programs to ensure our students become our 21st century career creators, our community leaders,” said Chancellor Maenette Benham. “The rankings reflect their good work and aloha for the communities and the people we serve." In another ranking, the Chronicle for Higher Education’s Almanac of Higher Education 2018-19 listed UH West Oʻahu’s enrollment growth as top among 86 public baccalaureate granting institutions. Enrollment jumped 239 percent between 2006, when the campus had 866 students, and 2016, when there were 2,939 students. 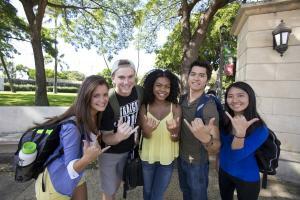 UH Hilo is ranked in the 96-127 category among Regional Universities West. Schools are rated according to performance across a set of widely accepted indicators of excellence. Also in the 2019 U.S. News and World Report ranking of Best Undergraduate Business Programs, the Shidler College of Business improved to 108th out of 503 national business schools accredited by the Association to Advance Collegiate Schools of Business. The college’s international business program was ranked 18th along with top schools such as New York University, University of Southern California, University of California, Berkeley, University of Michigan and the University of Pennsylvania. For the past 10 years, the college has been ranked consistently in the top 25 in international business.